ABS anti-shock plastic. This ABS plastic has great impact on anti-shock, thus makes the product durable. Sunlight is absorbed by the solar panel of these solar powered motion lights and transformed into electricity. No wires, no need to hook it up to the electricity grid. light only activated after movement is detected in dark. After main lighting around 15 seconds,back lighting around 1 minutes. it turns off automatically and leaves total darkness. Durable and waterproof: This solar security light is waterproof and durable, its specifically designed to withstand heavy outdoors use. No fear of rain or storm with this solar motion security light! The on/off switch is hidden in a hole designed to be waterproof. 1.For the first time use ,please charge it by placing it under direct sun shine for at least 8 hours. 2.The working time and charging time depend on the weather condition,the season and the location.So it may take longer time to fully charge the device and this is very normal for solar products. 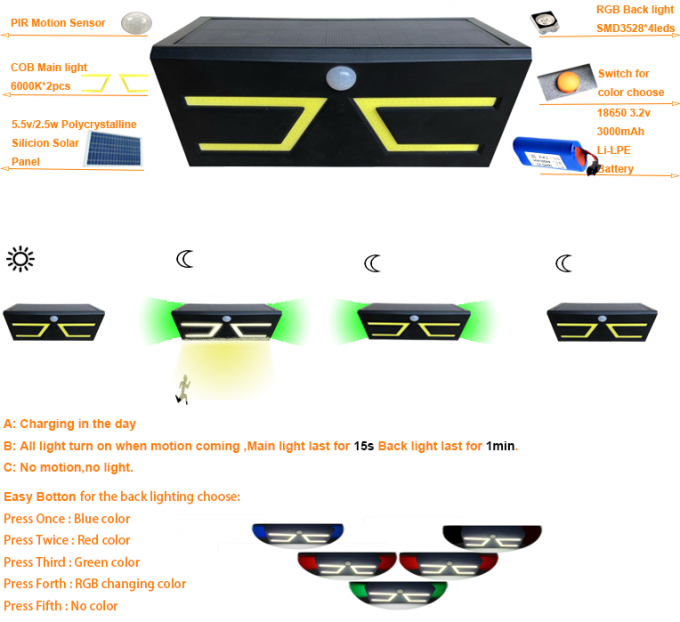 3.If the light is blink,it means the power is very low,You have to charge it by sunlight soon,otherwise , the devic e will stop working soon. 4.Please remove the plastic film from the top of the solar panel before use. 5.Keep the solar panel clean.